As I mentioned in last week’s article, our feeders have been swarmed by Pine Siskins. 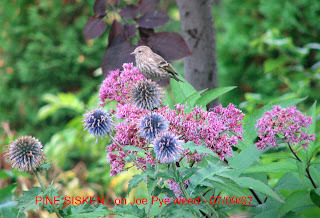 Along with Goldfinches and Redpolls, Pine Siskins belong to a subfamily of birds known as Carduelis Finches (see article 15). Like most seedeaters, their preference seems to be niger (sometimes spelled nyjer) seed; although, they will eat canola and commercially prepared mixed bird seed. Of all the Carduelis Finches, Pine Siskins will most readily hang upside down to feed. It is amusing to watch their acrobatic antics. Pine Siskins are moderately migratory going as far south as northern Mexico. I have seen them at feeders in southern Arizona and Texas in the winter time. Most spend the winter a little further north than that. They do not seem to be in any rush to head north to their nesting grounds arriving here about the first of May. On the other hand they are in no rush to go south either, and stragglers can be seen in December. Maybe they are just procrastinators that hate flying long distances, so they delay the trip. Only the Siskins know. Siskins are the size of small sparrows and are coloured much like them. They are rather nondescript brown birds with grey breasts heavily striped with brown. Males and females are quite similar. The difference is that the males have yellow on their wings and tail; the females do not. The yellow markings are most noticeable when the birds are squabbling among themselves at the feeders. During these “avian disagreements” the birds do a lot of fluttering and the yellow is more exposed. At other times Siskins will square off by facing each other, raising their wings, fanning their tails and hissing at one another much like geese do! This is, also, a good time to separate the males from the females. Their overall behavior and vocalizations are very similar to the Goldfinches. Like the Goldfinches, Siskins nest later in the season, but not as late as the Goldfinches do. Even with feeders present, Siskins still like to feed on thistles, dandelions and milkweed seeds. The thistle down is used in nest making. Unlike Goldfinches, which will nest in a variety of trees, Siskins, as their name implies, nest solely in evergreens. Until recently, Pine Siskins were only transients that nested in the Boreal Forest. Now they have become summer residents breeding in towns with sufficient plantings of evergreen trees. Foam Lake is a good example. At present there is no explanation for this change in behavior. There were farmsteads and towns with substantial plantings of evergreens in the past, yet Siskins did not stay for the summer. Why now, and not before, is anybody’s guess. A few years ago, I was working in our front yard under the evergreens when I heard a plaintive twee sound. As I worked, the sound continued – like a broken record. I recognized the sound as that made by a Pine Siskin, but decided to check why it was making it. About three metres high in the spruce was a nest with a female sitting in it. The female Siskin just did not want me to be that close, and to me, it sounded as if she was complaining. I walked away and the “whining” stopped. Who knows? There might be a nest in your yard. If you come close to the nest, the Siskins will let you know.